Biopsy of hazy, superficially ulcerated lesion on right vocal cord (left of image) shows only “necrosis.” There is no proof but only a question whether this necrosis may be a side effect of the bevacizumab (Avastin) the patient is taking for lung cancer. Open phase of vibration (strobe light) shows that only the left cord (right of image) oscillates. Closed phase of vibration (strobe light) shows that closure is result of left cord excursion. Several months after discontinuing bevacizumab, the right vocal cord ulcer has healed. Narrow band illumination accentuates the ingrowth of new capillaries. 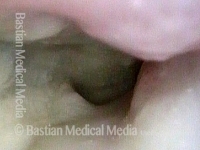 Phonatory match (standard light) is improved, but the right vocal cord (left of image) remains stiff, as the ulcer has been replaced by scar tissue. This patient was originally treated for early vocal cord cancer with radiation. Tumor persistence required hemilaryngectomy. Then nearly a year later, he developed a neck metastasis (in a lymph node). Neck dissection was performed, but the tumor was found to have penetrated the capsule of the lymph node (a high-risk finding for recurrence), so he received “insurance policy” proton beam radiotherapy of the right side of the neck. 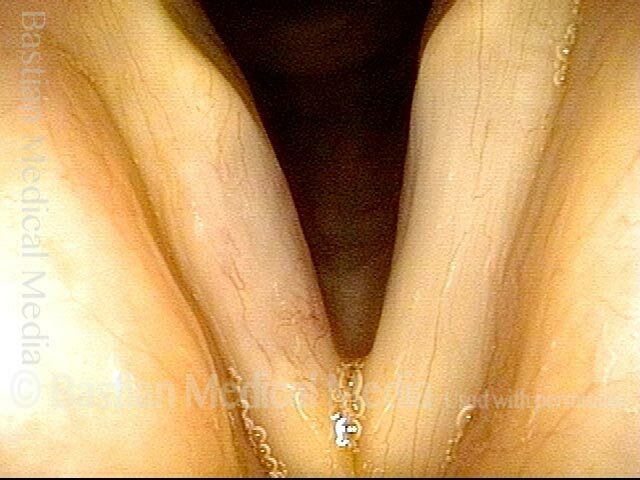 Unfortunately the posterior edge of the thyroid cartilage became necrotic due to the “double dose” of radiation. In this view, one only sees swelling of the right arytenoid mound, but the pyriform sinus is closed and the necrotic area cannot yet be seen. Here, the patient is performing the trumpet maneuver to splay open the right pyriform sinus. The area of necrosis is beginning to be seen at arrow. The necrotic tissue is seen here at a much closer range. An even closer view into the necrotic pyriform sinus. Multiple biopsies have been taken from this area to be sure there is no cancer. Eventually, this larynx had to be removed not for cancer, but for this radiation complication.